April 25, 2000 -- Two weeks ago stargazers around the world were outdoors in force. The moon, Jupiter, Saturn and Mars were clustered together in the evening sky on April 6 for a picturesque display just after sunset. With cameras poised to record the spectacle, observers were treated to a dazzling show -- but it wasn't the show they expected! The sky, instead of darkening as the sun sank below the western horizon, turned vivid red, then green and shimmering yellow. 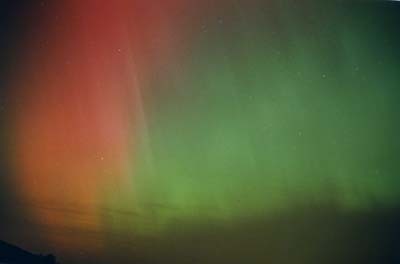 It was a rare and unexpected display of aurora borealis seen as far south as Texas and Florida. "My intent was to capture the crescent moon along with Saturn, Jupiter and Mars," said Keith Cooley, an amateur astrophotographer in Athens, Alabama. 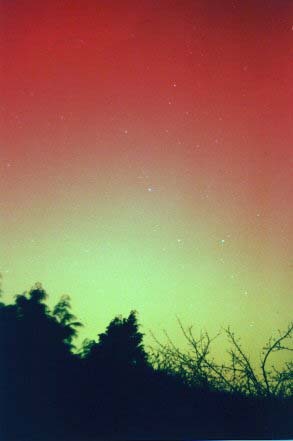 "The aurora flare up was sudden and without warning! It was my first observation ever of such an event." The celestial display started around 1630 UT on April 6 when a powerful interplanetary shock wave passed by the Earth. 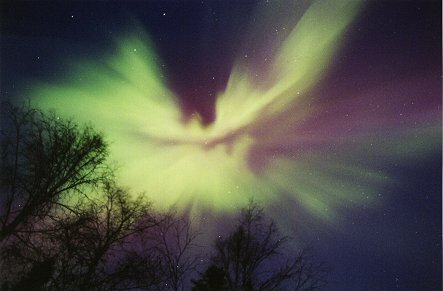 Aurora borealis was observed almost immediately over Asia and Europe. Auroras, or "Northern Lights", are usually confined to high latitudes, but this was the biggest geomagnetic storm in years. 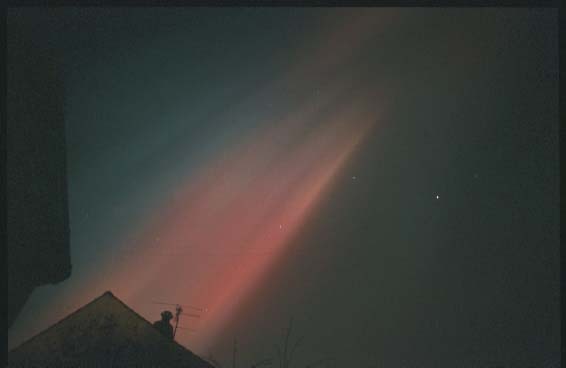 By 2000 UT, observers in central Europe were reporting colorful lights in the sky. 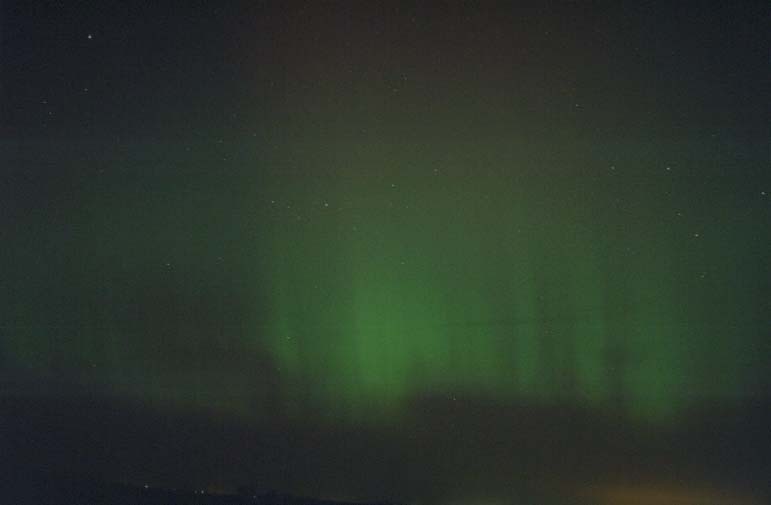 "Aurora borealis is a rare event in our area, so to see it for the very first time is impressive -- to see a display like [this was] really dazzling!" recounted Ron Baart of Warmenhuizen, Holland. 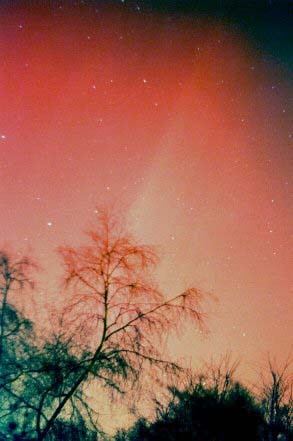 "It was about 10:55 p.m. local time [on April 6] that we saw a pillar of red light in the northern sky... also green-blue to white features could be seen dancing in the heavens." Left: Juergen Rendtel snapped this photo from Marquardt (near Potsdam), Germany. (camera: f/4, f=20 mm lens; film: Ektapress 1600; exposure time: 15-30 seconds). By the time night fell over North America, the geomagnetic storm was beginning to subside, but not before auroras were spotted in at least 23 states. Reports poured in from as far south as Florida and as far west as Utah. "Most of northwest Colorado was cloud-covered the night of April 6," recalls James Westlake, Professor of Astronomy at Colorado Mountain College in Steamboat Springs, CO, "so I took a group of SKY Club members ... west into Utah. We weren't disappointed. From near Moab, Utah, we watched the pink and green fountains spurt above the northern horizon for several hours around midnight!" 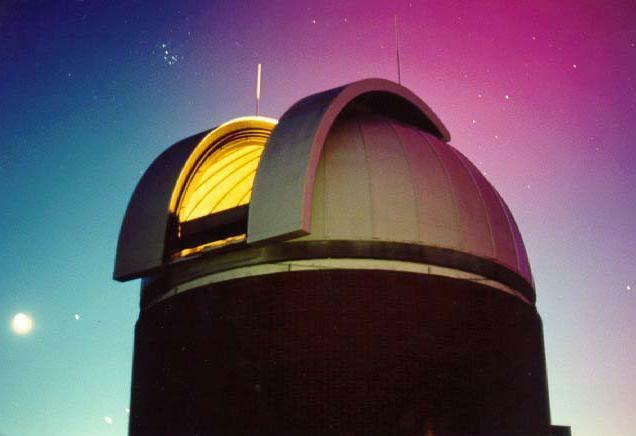 In the Big Bend region of Texas, observers at the McDonald Observatory were surprised when the sky suddenly turned red during a star party. thought to be a brush fire," wrote Frank Cianciolo, a public affairs officer at the University of Texas. 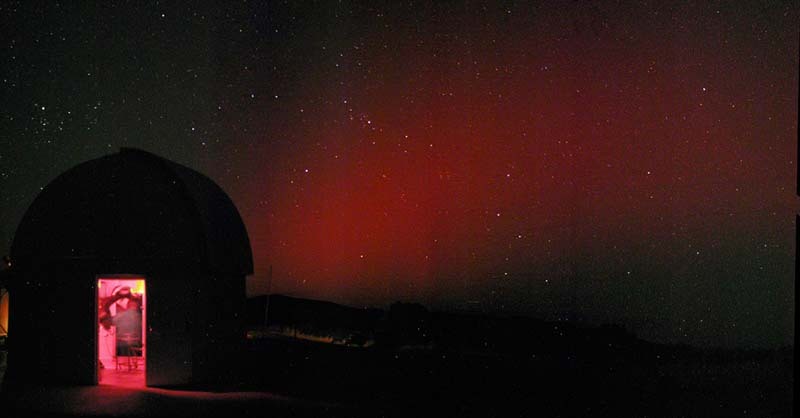 "He quickly realized the truth of the matter, grabbed our digital still camera and popped off a small panoramic showing the aurora and one of our public domes (pictured above)." In all, Science@NASA has received over 40 pictures of spectacular aurorae from readers who were outdoors on April 6 and 7, 2000. Please see the gallery of images, below. Click here for a gallery of aurora images! 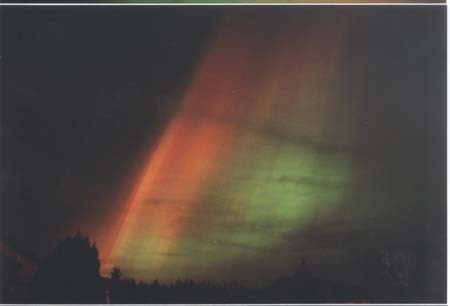 Auroral light is similar to the light from a color television. In the picture tube, a beam of electrons strikes the screen making it glow in different colors, according to the type of chemicals (phosphors) that coat the glass. During a display of aurora borealis, the air glows as charged particles rain down from space along Earth's magnetic field lines. The resulting color depends on the type of molecules that the charged particles hit. The electrons and protons that rain down on our atmosphere to produce colorful Northern Lights don't come directly from the solar wind. Instead, they follow a more circuitous route through the "magnetotail." 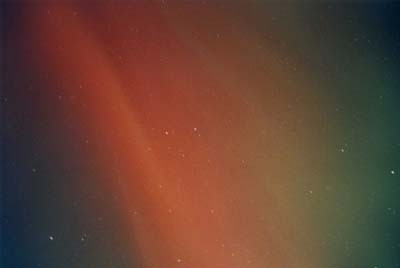 The magnetotail is an area of space behind the night side of Earth where the solar wind stretches the magnetic field into a long comet-like tail. Inside the magnetotail is the "plasma sheet," a region that's densely populated with ionized gas. Although it's more than 60,000 km away, what happens in the plasma sheet is crucial to auroral activity. When an energetic burst of solar particles strikes the magnetosphere, it compresses the magnetic field and stretches the magnetotail more than normal. This causes neighboring magnetic field lines with opposite polarities to connect inside the plasma sheet. Intense electric fields created by this magnetic reconnection launch plasma toward the Earth's north and south magnetic poles where it strikes the atmosphere, triggering aurora in a circular line called the auroral oval. This graphic, courtesy of the University of Alaska Geophysical Institute, shows the average auroral oval above the Northern hemisphere. During geomagnetic storms the oval expands so that people farther south can also see the Northern lights. There is a similar oval over the Earth's south magnetic pole. 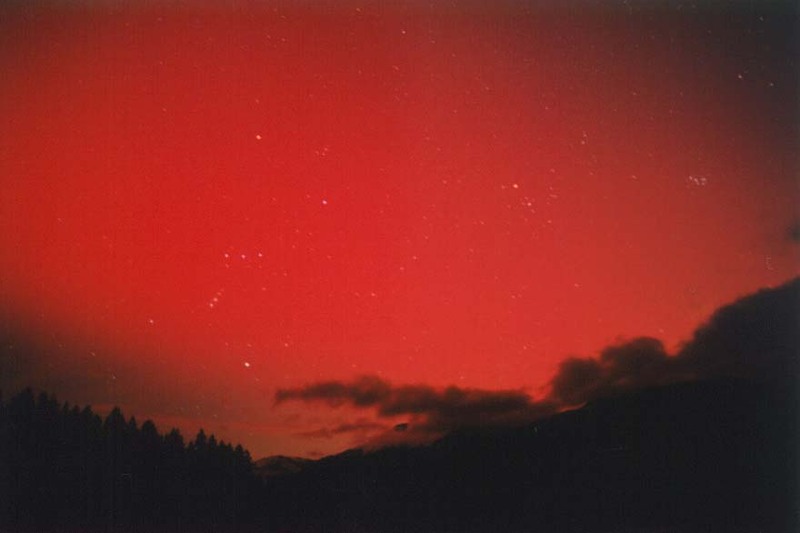 However, most aurorae there occur over uninhabited areas. 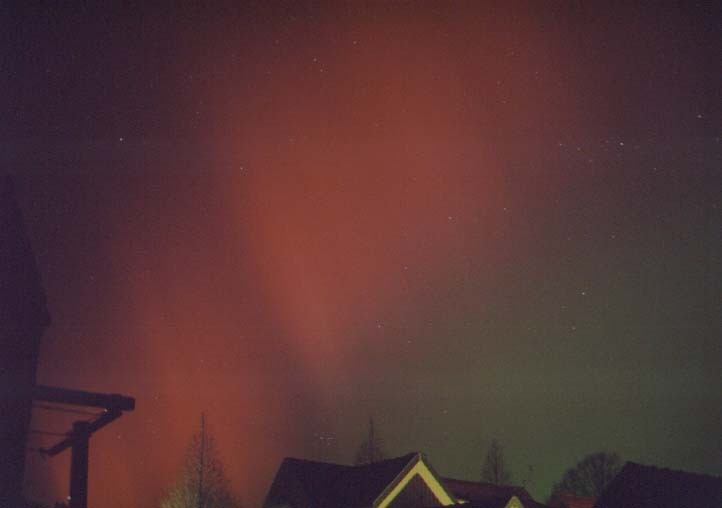 Many observers said that the Northern Lights they saw on April 6 were predominately red. 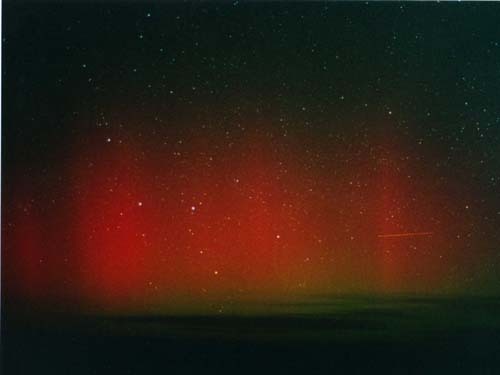 Energetic particles striking oxygen molecules, about 200 miles up, is what causes these unusual, all-red auroras. Oxygen at lower altitudes, about 60 miles high, produces a brilliant yellow-green, the brightest and most common color. Nitrogen molecules also add color to the display. Ionized nitrogen gives off blue light while neutral nitrogen glows red. 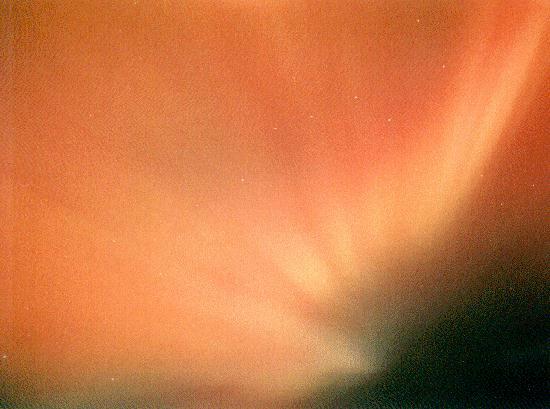 The nitrogens create the purplish-red lower borders and ripple edges seen in many auroras. Although auroral lights sometimes seem very low to the ground, they are in fact higher in the atmosphere than the highest of jet planes. The lowest fringes are at least 40 miles above the Earth, while the uppermost reaches of the aurora extend 600 miles above our planet. For comparison, the space shuttle orbits near 190 miles altitude. Only astronauts can fly through the aurora! Day in and day out, the best places to be for aurora watching include Fairbanks, Alaska, parts of Eastern Canada, Iceland, and the Scandinavian countries of northern Europe. These sites are close to the average auroral oval -- a circular line around Earth's north magnetic pole where auroral activity is greatest. The farther you live from the auroral oval, the smaller your chances of seeing aurora. 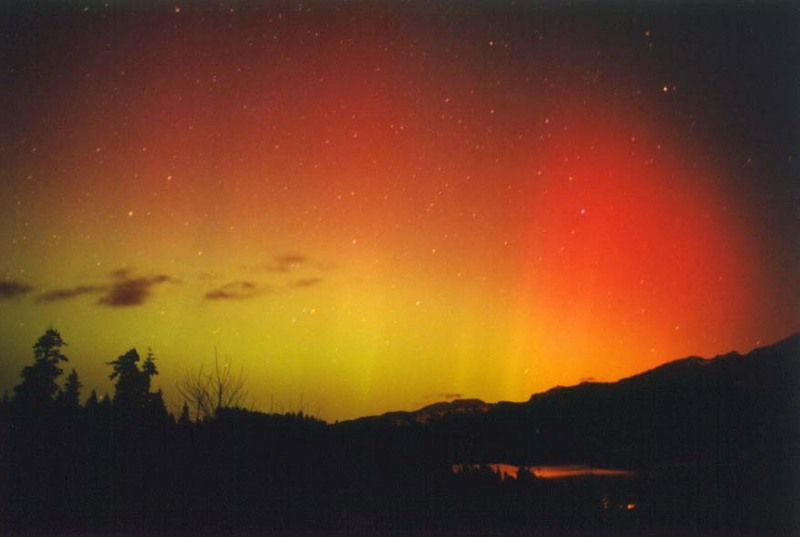 For example, aurora borealis in the southeastern United States happens just once every ten years or so. 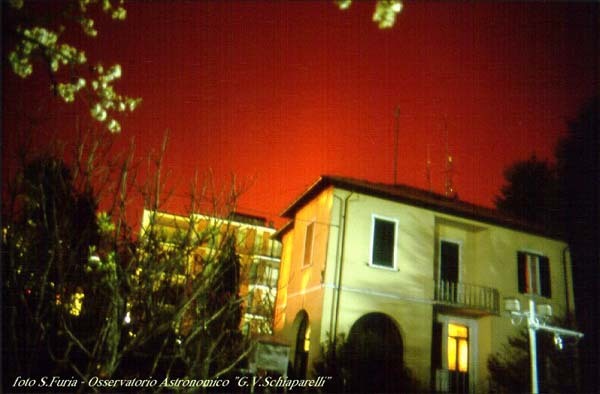 The last time (prior to April 6, 2000) was during the great geomagnetic storm of March, 1989. People all the way down in the Florida Panhandle enjoyed a display of Northern Lights that came and went for nearly two days. 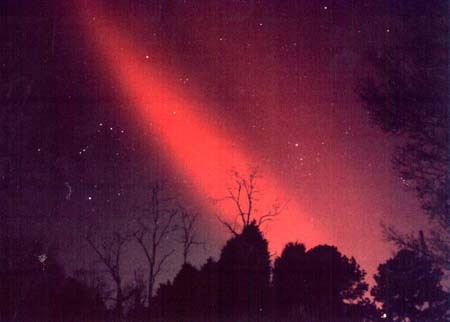 The Aurora Watchers Handbook lists the following "Great Geomagnetic Storms" of the 20th century when auroras were seen much farther south than usual. 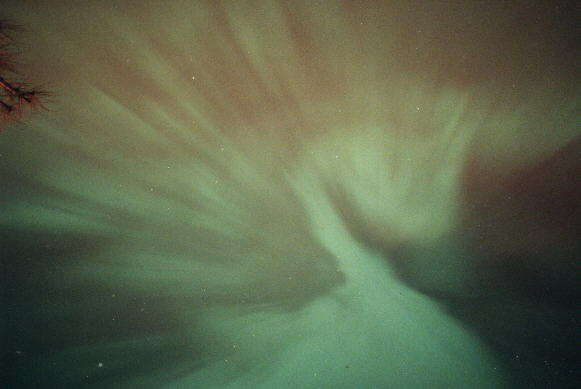 If you have a childhood memory of aurora borealis, it may have come from one of these storms. Now, of course, April 6, 2000 can be added to the list. 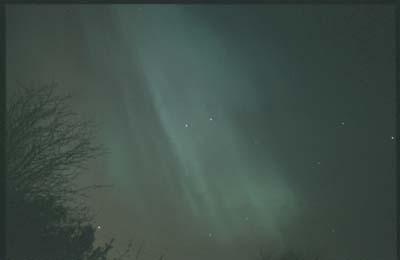 If you missed the auroral storm on April 6, there's no need for despair. Forecasters say additional geomagnetic disturbances are likely with the arrival of solar maximum in mid-2000. "[The April 6] storm reached G4 on the Space Weather Scale," says Gary Heckman, a space weather expert at the NOAA Space Environment Center. "For comparison, the great storm of March 1989 would have been a robust G5 for two nights running. So maybe the activity we expect with the solar maximum period is just now heating up." According to David Hathaway, a solar physicist at the NASA Marshall Space Flight Center, peak levels of geomagnetic activity tend to occur somewhat later than the peak of the sunspot cycle. "Geomagnetic storms are often triggered by solar wind from coronal holes, which are somewhat more common just after the sunspot maximum," explains Hathaway. "Many people think the solar maximum is specific date on the calendar, but it's not. Solar Max starts in mid-2000 and it will last for a year or so. All during that time, and for a while afterward, we can expect to see more geomagnetic activity than usual." So there's hope. Southern observers who were clouded out on April 6 might yet see the aurora for themselves. Meanwhile, you can enjoy what others saw on April 6, 2000 by perusing the gallery of images (below). All of the images were contributed by Science@NASA readers. 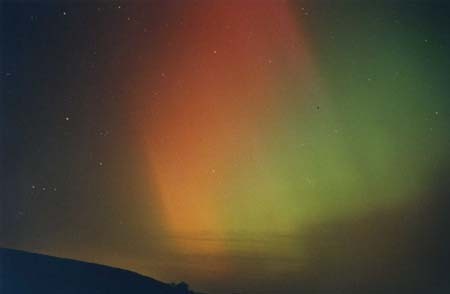 Multicolored aurora. Picture #4 displays a striking ray pattern. 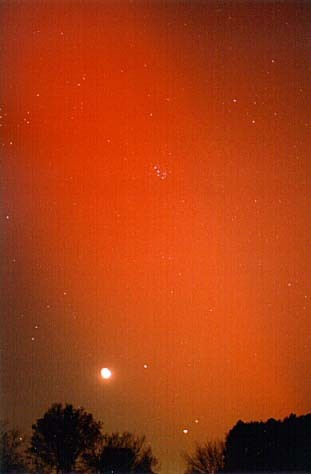 Photographed with a digital camera at 9:30 p.m. CDT on April 6, 2000; shows an observatory dome silhouetted against red aurora. 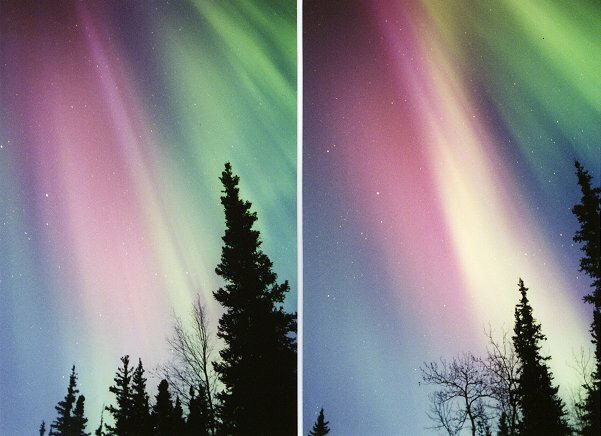 These false-color images show ultraviolet radiation from Earth's northern auroral oval less than one hour after an interplanetary shock wave triggered the geomagnetic storm on April 6, 2000. 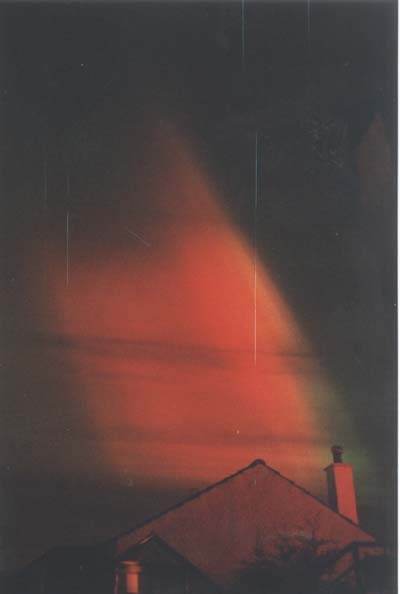 Red and green-colored sky glow. 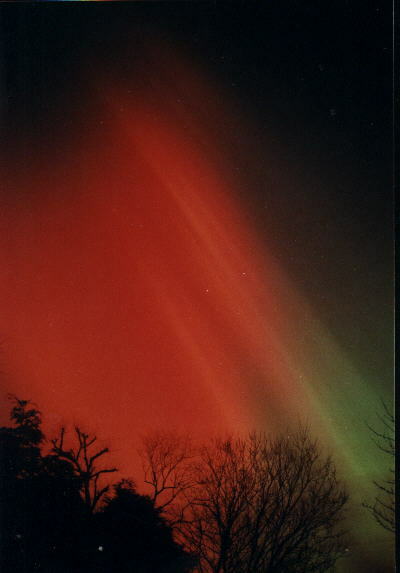 Red and green-colored auroras with ray structures. , more Photo #1 shows the April 6 planetary conjunction just before the onset of the auroral storm. 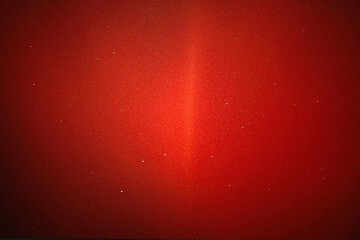 Photo #2 shows the Big Dipper awash in the red glow of the aurora. More images can be found at Wielinga's web site. 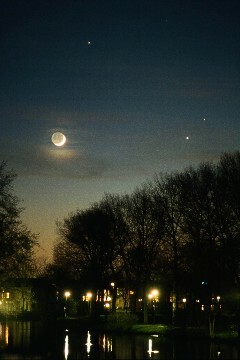 , more Orange-red sky glow with the Moon, Jupiter, Mars and Saturn in the background. 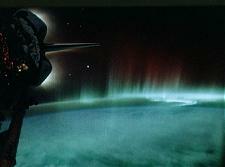 For more information about geomagnetic storms, visit the NOAA Space Environment Center web site or SpaceWeather.com. 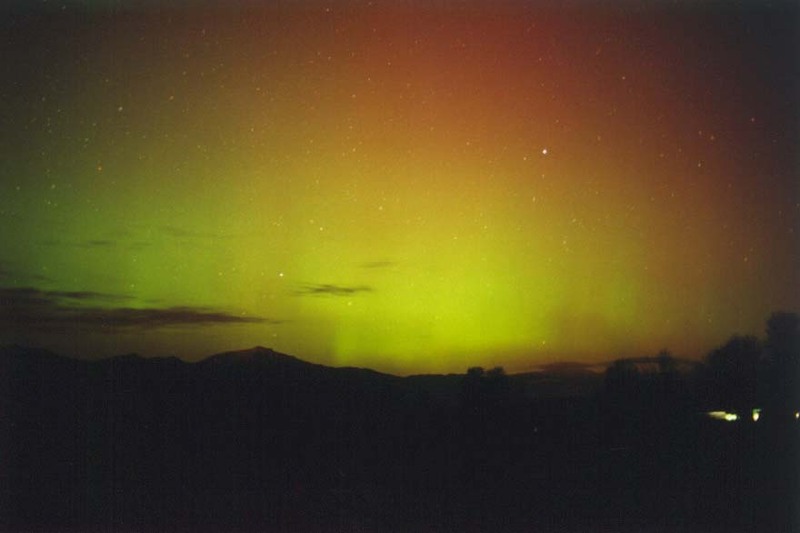 Thursday's Classroom -- lesson plans and educational activities about space weather.